Imagine that you are zooming outward from the chair you are sitting on while reading this book. You see the place where you were sitting recede into its continent, and then the curvature of our planet Earth appears, growing smaller and smaller, joined by the other planets of our star, the Sun. Our solar system, too, grows smaller and seems to hover in emptiness against the background of our galaxy, the Milky Way. And then, as you continue zooming through the Milky Way it too becomes a speck and disappears, lost in the vastness of the universe. Our solar system is about 12 × 109 km in diameter, but the next closest star is just over four light years away (Murphy 2006)-a distance of over three thousand times that diameter. The Milky Way consists of about two hundred billion stars and is about one hundred thousand light years (~9.5 × 1017 km) in diameter. The farthest point of the universe we can see is about 13.5 billion light years away and contains a vast number of stars-and perhaps a vast number of planets? Our planet, and our Sun that provides the energy for life here, are truly insignificant at the scale of the universe. But how unique are humans as a form of intelligent life capable of thinking about our place in the universe? Humans appear to have been fascinated for a long time by the possibility of extraterrestrial intelligent life-from our earliest ancestors' animations of star formations and planets to present-day astrobiologists quantifying the possibilities of life-supporting planets in the universe, such as NASA's Kepler mission, "a search for habitable planets" (Kepler 2013). Kepler will explore about 156,000 nearby stars, and as of the end of 2012 it had confirmed the existence over sixty planets. It would be easy to jump to the conclusion that there must be intelligent life out there, given the vastness of the universe. However, Howard Smith, an astronomer at Harvard University, argues that available data suggest that the number of "even vaguely suitable stars with possible habitable planets" is very small, and the probability of intelligent life evolving on them is "much slimmer" (Smith 2011). He concludes that even if we waited for one hundred human generations, any signals reaching us would not be from further than 1,250 light years away, which is a tiny portion of the universe. So, even if the universe were infinitely large and lasted infinitely long, making the probability of other intelligent life evolving very high, the chances of us Earthlings detecting it, much less interacting with it, are pretty darn slim. We humans are most likely not going to get help from another planet-we are on our own in figuring out how to get out of the food and agriculture problems we have gotten ourselves into. Nor will we likely get help from contemplating the meaning of it all because there is no evidence that the universe itself has any meaning or purpose that we can discover. As Steven Weinberg, the Nobel Prize-winning physicist, famously remarked, "The more the universe seems comprehensible, the more it seems pointless" (Weinberg 1994). Yet I think that seeing our human problems in deep time and space-in the context of the evolution of the universe-can help us to put things in perspective. It suggests to me that it is up to us-as individuals, as members of local communities, and ultimately as a global community-to define our purpose in the universe, including how we treat our planet and one another, and how we feed ourselves. We can't expect that the universe will provide a purpose, or that intelligent beings from another planet will come to our aid in helping us discern one-or in solving our food crisis. Whether we do solve the world food crisis depends on our ability to understand the problem and conceive of solutions. It also depends on consciously deciding, individually and collectively, that coming up with a solution is our goal, and then committing the resources needed to achieve that goal. As a step toward understanding, this chapter takes a broad view of the relationship between the demand and supply sides of our agrifood systems, including basic principles of life in the context of our planet and universe, how human populations and their impacts on the Earth grow, the Malthusian conflict of potentially limitless growth of population and consumption and the limited human carrying capacity of the Earth, and finally, the options for human response when we enter the zone where human impact exceeds human carrying capacity. Although humans are a relatively intelligent life form living on a tiny speck of stardust in the vastness of the universe, we are subject to the same forces that govern the rest of the universe, including the laws of thermodynamics. The second law states that entropy-a dispersion and loss of order (information) in matter and energy-always increases, as confirmed by observation of the universe since its beginning in the big bang almost fourteen billion years ago. Yet life temporarily resists the second law in small areas of space-time in its interaction with geochemical cycles (Kleidon 2010), as in James Lovelock's Gaia hypothesis (Lovelock 1986); it pumps order in the form of energy and matter from the outside environment into the living organism, extracting order to build and maintain life, and sheds degraded (higher-entropy, less-ordered) energy and matter as waste products. These waste products can have major negative impacts for future life-a prime example being our export of carbon dioxide to the atmosphere, which is driving global warming. Agriculture is a strategy for supporting human life, increasing the flow of information and resources through human bodies and human-managed systems. It is a strategy that has supported increasing levels of human population and consumption, with major impacts on the environment and society. Of course, as part of the universe, life is an endgame-eventually the second law will conquer all. But we humans exist at some point in time between the beginning and the end of the universe, and this is where all the fun is-figuring out what to do with this amazing opportunity. Understanding the opportunity we humans have requires understanding biological and sociocultural evolution and the relationship between these processes, which do not always work in the same direction. Biological evolution may be defined as cumulative genetic change over generations resulting from the selection of phenotypic (physical) traits with some heritable basis. Biological fitness is a measure of the number of copies of genes passed on to the next generation-that is, of how successful genes, organisms, or populations are in reproducing themselves (Wilson and Wilson 2008). Beginning at the time it first comes into existence, a population (or species) must increase in order to survive. A population constantly decreasing in size will eventually become extinct. The population of any biologically successful population or species tends to increase until limited directly or indirectly by the environmental carrying capacity for that organism. Biological fitness is nonteleological. In other words, it is not future or goal oriented and is not an absolute, but a relative, value; it is defined by the specific environment in which an allele (a form of a gene), organism, or population exists (Wilson and Wilson 2008). The environment includes physical components such as temperature, soil, and moisture; other species including food, competitors, hosts, and parasites; and the demographic and genetic structure of the population being considered, or to which the individual organism of interest belongs (Hedrick 2005:204ff.). In addition, fitness trends at different scales may be inconsistent, so that increasing fitness values at one level can be coupled with decreasing fitness values at an adjacent level (Wilson and Wilson 2008). For example, a population of organisms with high relative fitness may evolve in response to changing selection pressures of a particular microenvironment, resulting in reduced fitness of that population in comparison with others in the larger environment, leading to reduced size or extinction of that population (Bergelson and Purrington 2002, Endler 1986:43-44). Ecologists have described the adaptation of population growth rates via evolution in terms of r and K selection (MacArthur and Wilson 1967:149ff.). Where resources are variable and abundant, r selection favors species with high, unregulated growth rates. In environments with less variable and scarcer resources, K selection favors species with growth rates that decrease as the population grows in response to feedback from the environment indicating resource scarcity. These species' growth rate is described as density dependent, as it slows with increasing population density, allowing the species to survive and persist over the longer term. Selection operates against species that do not limit growth under such conditions. This shows that the criteria of biological fitness can vary through time as the nature of the resources organisms depend on changes. However, the evolution of phenotypes via selection by their natural environment over generations depends entirely on existing information, not predictions for future conditions. This means that evolutionary biological success is a measure that can look only from the present backward, into the past. Whatever drives organisms to multiply can be modified only by current environmental conditions; there is no mechanism whereby probable future environmental conditions can affect the reproductive drive of present organisms. Current conditions themselves may be "predictors" of future conditions when they are part of a trend-for example, if there is a tendency over time for a decrease in a required nutrient, selection may favor an organism adapted to lower availability, which may be preadapted to even lower future availability.However, present conditions are not always good predictors of future conditions; for example, when a threshold is passed, triggering an acceleration in rate of change or a state change, adaptation to the present may result in reduced fitness under future conditions. In contrast, the human capacity to anticipate the future with some accuracy allows us unique influence over our future biological success, depending on the time frame we are interested in. We humans are an extraordinary species in the extent to which we have devised strategies to successfully direct more and more of the Earth's resources to our consumption. In a sense, through our cognitive abilities, we have expanded the environmental space for r selection for Homo sapiens, creating what appear to be unlimited resources. Our evolutionary biological success has functioned as it does in other species-it has been based on current environmental conditions, not on likely future ones. The diversion of energy and matter for the expansion of our population has increased for generations, especially in some parts of the world, with most of this increase based on assessments of our environment today, not of the future environmental impacts of that diversion. Thus, to a great extent, our cognitive abilities have been applied to supporting human biological fitness in the present, not to overcoming the inherent shortsightedness of biological selection and fitness. This leads to what I call the fitness paradox-humans have been successful in increasing our numbers and rates of consumption by dominating the Earth's resource cycles to a greater degree over a shorter time span than any other species with individuals of similar size. The paradox is that this past success threatens our future survival. That is, biological success as defined under r selection has a threshold beyond which it turns into biological failure, because of the conflict between an increasing number of organisms and their impact on the limited resources needed to support them. As that resource threshold is approached, success is increasingly determined by the logic of K selection. The human species, much more than any other, has the ability to predict the future based on knowledge of past events and to change our behaviors and institutions based on solid predictions. So the question is: Will humans be able to transition from an r-selection to a K-selection mode of growth via sociocultural evolution? The economist Kenneth Boulding described a situation analogous to r and K selection in terms of sociocultural evolution: he contrasted unlimited or open systems, where growth-centered "cowboy economics" is successful in the short term, with limited or closed systems, where steady-state-centered "spaceman economics" is required to avoid disaster (Boulding 1968). "Spaceman economics" implies that humans can incorporate predictions about the future and about the effects of their present actions on that future in decision making. It also suggests that humans have goals for how they want the future to be, as well as ideas about what actions are needed to achieve those goals (see chapter 3 for more details). The critical questions are: What mechanisms are responsible for the transition from "cowboy" to "spaceman" economics? And what kind of life does that transition lead to-for example, a stable population size with short average life span or a stable population size with long average life span (Cohen 1995); a stable level of consumption equitably distributed or a stable level of consumption with a few living in extreme luxury and the rest impoverished? Thus, for Homo sapiens, incorporated within the fitness paradox is a cognitive paradox-the human cognitive abilities that helped to create the fitness paradox also offer a solution-we can resolve the cognitive paradox and think our way out of the fitness paradox! In other words, while evolution blindly evolved cognitive traits to increase short-term biological fitness, these traits included behavioral plasticity and the ability to consciously control thoughts and behaviors. Consciousness allows me to reflect on "myself" in this sentence, and it allows you to do the same when you read it (Hofstadter 2007), in order to make decisions about the future. For example, some tendencies-such as empathy, sociality, and altruism-can be consciously encouraged at the individual or group level, while other traits-such as territoriality, materialism, and greed-can be subdued, or vice versa. Our decisions, active or passive, about what characteristics should be and are promoted will affect the long-term fitness of Homo sapiens (Wilson et al. 2009). Our sociocultural evolution will have a major impact on the future of our biological evolution and sucess. No matter how we choose to address our problems, it is helpful to recognize that humans will not persist indefinitely. Of course, there will be periods of relative homeostasis where forces tending to cause increase or decrease of a population or species in a given environment are balanced. However, over evolutionary time, homeostasis is not the rule-populations and species come into being and some time later become extinct. Evolutionary success is always temporary; no individual, population, or species lives forever, even those with the ability to evolve rapidly in response to changing conditions. One estimate of the average life span of a species based on the fossil record is about three million years (Gilinsky et al. 1989, Gould et al. 1987). This is analogous to the situation within individual organisms where physiological systems tend to be homeostatic during the life of the individual, yet all individual organisms eventually die. It is not clear at this point what the balance will be between our ability to change our environment and our ability to change our behavior to avoid extinction. However, as is true for a finite individual organism, there are different ways for us as a species to approach the opportunity we have for life and different choices we can make about how we experience it. This book is an interdisciplinary primer on critical thinking and effective action for the future of our global agrifood system, based on an understanding of the system’s biological and sociocultural roots. Key components of the book are a thorough analysis of the assumptions underlying different perspectives on problems related to food and agriculture around the world and a discussion of alternative solutions. 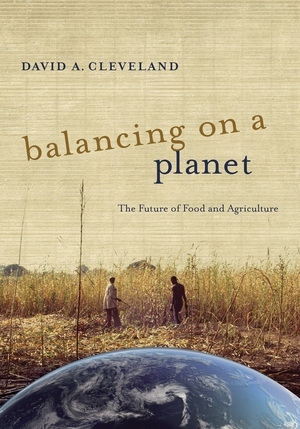 David Cleveland argues that combining selected aspects of small-scale traditional agriculture with modern scientific agriculture can help balance our biological need for food with its environmental impact—and continue to fulfill cultural, social, and psychological needs related to food. 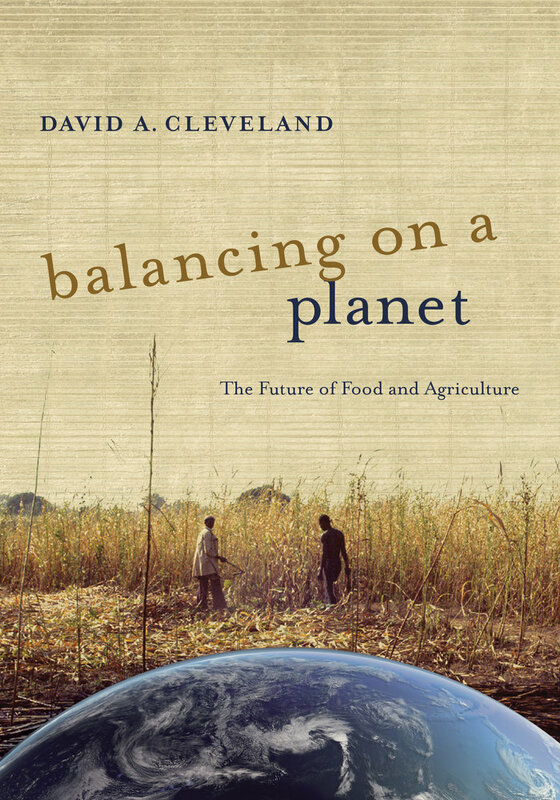 Balancing on a Planet is based on Cleveland’s research and engaging teaching about food and agriculture for more than three decades. It is a tool to help students, faculty, researchers, and interested readers understand debates about the current crisis and alternatives for the future. David A. Cleveland is Professor of Environmental Studies at the University of California, Santa Barbara. He is a human ecologist whose research and teaching are on small-scale, sustainable agriculture. He has worked with farmers around the world, including in Ghana, Mexico, Zuni, Hopi, Pakistan, and the United States. He is currently researching the potential benefits of agrifood system localization on climate change, nutrition, and food sovereignty.